This unique woman is a real embodiment of the qualities which can lead one to success: she is a convinced self-seeker who possesses natural intuition for the talents, ideas and right decisions, strict style of management and remarkable courage. All these points have contributed to the fact that she has become the most influential expert in the fashion industry. The editor-in-chief of American Vogue Anna Wintour has been the head of the largest fashion-luster for thirty years already. Despite the gossips, she isn’t going to hand the things over to some other person. She certainly knows that nothing is appreciated in the changing fashion world as much as stability. 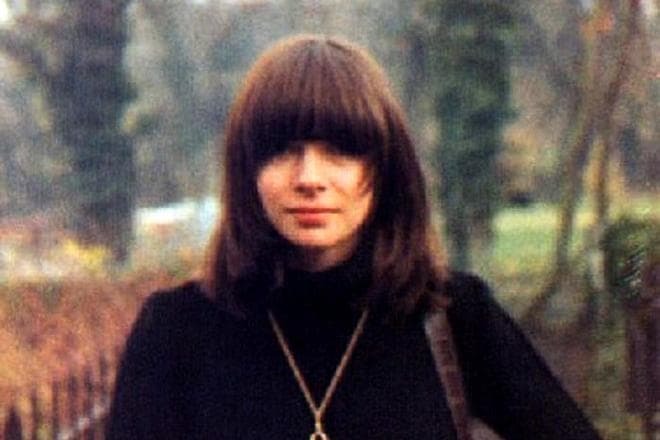 Anna Wintour was born on the 3rd of November of 1949 in London. The girl’s mother Eleonor Trego Baker is a daughter of Harvard law professor, a significant social activist. Her father Charles Wintour is the editor of the Evening Standard London newspaper. Evidently, from her father, the girl has inherited love for the printed word which in combination with the real interest in the fashion industry has later turned into the fancy for fashion-journalism. The girl was watching during long hours Katy McGowan's show who was the icon of the style at that time. The father jokingly advised his daughter, in answer to the question of the school questionnaire about the future profession, to write that she wanted "to become the editor-in-chief of Vogue magazine." The 10-year girl wasn't confused at all: the little lady already knew that she would have a great bright future. There is no information on whether Anna was satisfied with her appearance. Anyway, the girl experimented with her look as she was searching for the ideal image. At the age of fourteen, she had her hair cut as the bowl. She still has this haircut, and she doesn't change it even slightly. Also, she left her athletics training because due to the running her calves looked pumped up. When she had to attend the school, it was real torture for her just because she had to wear a hated uniform and to blend in the crowd. Young Wintour didn't hesitate to express her anger and could do it frankly in person – to her teachers and the administration. For such behavior, the young rebel was expelled from the school at the age of sixteen. The girl was just happy with such an opportunity –then she could spend 24 hours wearing her favorite fashionable outfits. She has already had working experience in the Biba shop where she could observe the customers. Already being a teenager, Anna has proved herself as a skilled marketing specialist, and she could even guess what the client wanted with the help of her intuition. For a good reason, it was his oldest daughter Anna among all five children with whom Charles Wintour was advising: she could give him great ideas on the youth headings, society columns, etc. Having left the studies, Anna got a job – her boyfriend Richard Neville offered her a position in his magazine Oz, a well-known edition at that time. 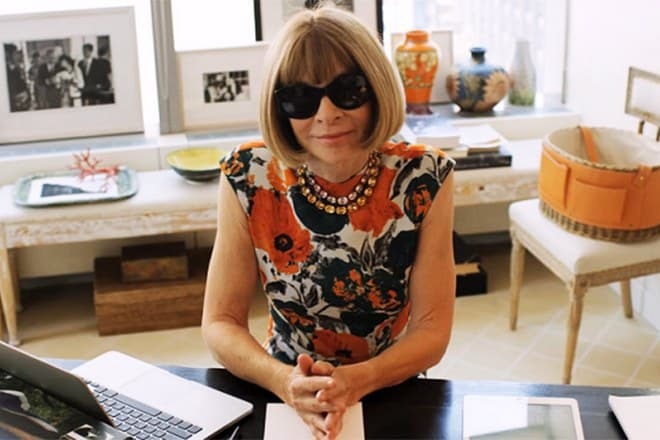 In such a way, Anna Wintour began her career. Wintour’s first position in the large fashion glossy magazine was the assistant editor of the department in Harpers&Queen magazine. Anna was just 21 years old at that time. Innovative shootings, new photographers and models, new ideas – all this has contributed to the fact that Wintour soon received the position of the deputy of the editor-in-chief in 1973. But in two years it appeared that she couldn’t get along with the new editor-in-chief Min Hogg and the woman left the magazine together with her boyfriend – the journalist John Bradshaw. The couple decided to try their chances in the U.S.
After their arrival in New York, it was John who helped Anna receive the position of the editor-in-chief in Viva magazine. 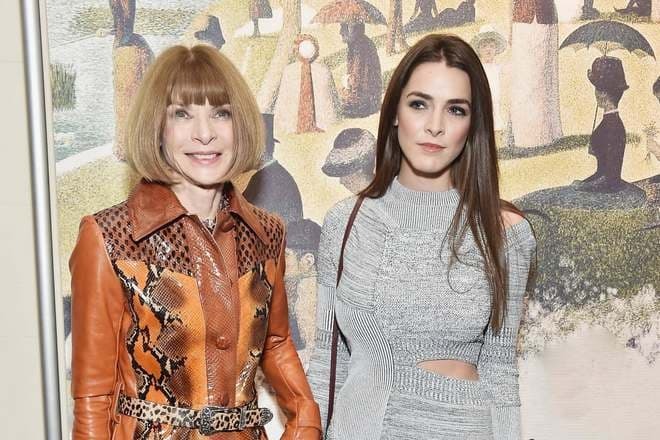 It happened after she had been fired from the American Harper’s Bazaar after nine months of work (the editor Tony Mazzola didn't want to make up with the unusual approach of Wintour). After Viva magazine had been closed in 1978, Anna made up her mind to have some rest. She began to visit her native town more often: her parents were preparing for the divorce (in 1979), and later her father married again to the journalist Audrey Slater. In 1980 Wintour settled in the new Savvy edition as a fashion editor. In the year she was invited to occupy the same position in New York magazine. The head of the edition Edward Kosner has given to the woman full freedom to embody her ideas. In response, Anna achieved the significant increase in the magazine circulations. Such success couldn’t be but noticed. Soon there happened what could be easily predicted – the head of Condé Nast Publications company - Alexander Liberman had poached Wintour and offered her the position of the creative director in the American VOGUE. The only thing about which Anna had asked Liberman (besides the double salary) was full freedom of actions. She began to work with the great enthusiasm which was characteristic of her. To be exact, she began to change the magazine’s style cardinally as she thought the previous one boring and unremarkable. Anna considered it a waste of time to respect the chain of command of the editor-in-chief Grace Mirabella. Therefore, in a short time there burst out the conflict between two women. Liberman left Grace on her position and sent Anna to London to raise the British VOGUE which needed improvements and reformation long ago. Anna began to work there in 1985, and at once she made the revolution. She fired half of the employees and began to master the details of the magazine's production. She entirely controlled the whole process. At the same time, the working stuff had to perform their duties flawlessly; otherwise, they could receive personal "execution" from Ms. Nuclear Winter. The "grateful" employees have given Wintour such a nickname ( play of the same-sounding words "winter-Wintour"). 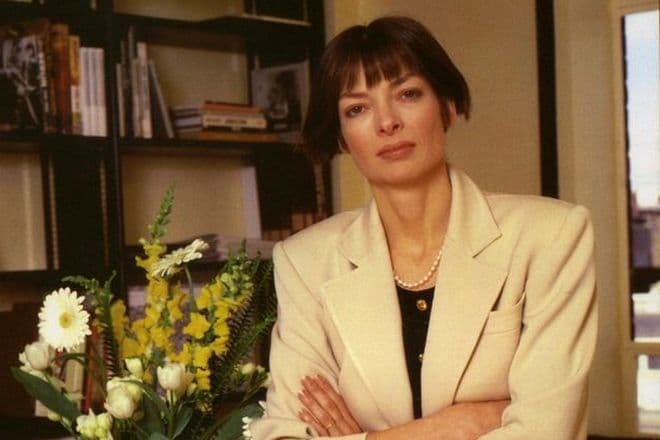 In 1988 Grace Mirabella left the position of the editor-in-chief of US Vogue, and the new queen of fashion gloss Anna Wintour took the duties. The first edition created under her leadership was released in November of 1988. Since then each photo on the was a discovery of the new fashion star: Natalia Vodianova, Cindy Crawford, Milla Jovovich, etc. 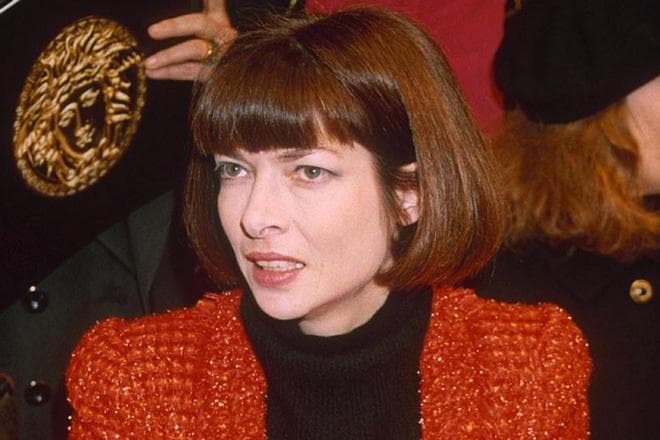 The nineties became a significant breakthrough in Wintour’s career: she won her competitors, having left behind Elle and Harper’s Bazaar magazines. She only didn’t manage to surpass Tina Brown – Vanity Fair's editor-in-chief. The war between two professionals of fashion gloss has become a legend. In 2017 one of the American TV companies dedicated the mini-series to their hostility. However, Anna didn't spare not only her competitors but her employees as well. Wintour’s perfectionism in addition to her rigorous character and authoritative style of directing made the life of her team just unbearable. The majority of her colleagues couldn't make up with the intolerable character of their lady-boss and left to other projects. And if earlier only people who were involved in the fashion industry were aware of it then in 2006 the whole world learned about Wintour’s dictatorship. The movie The Devil Wears Prada was based on the same-name book written by Lauren Weisberger. 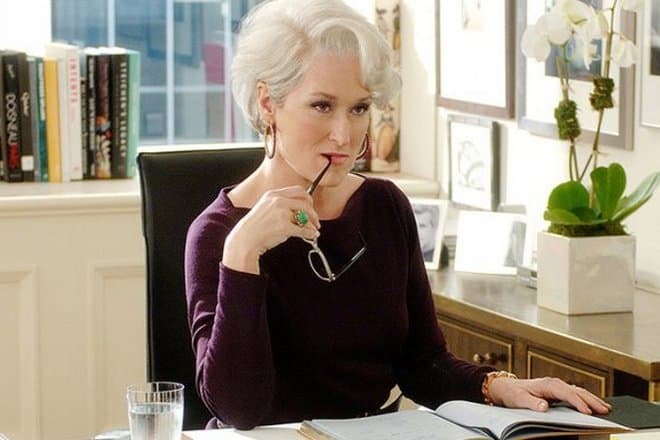 This book described the routine life of the edition in detail, and in the principal character of Miranda Priestly (performed by the actress Meryl Streep), one could easily recognize the tyrant Anna Wintour. At the same time, the prototype of the movie heroine was working nonstop in the fashion-editing. Anna launched Teen Vogue, Vogue Living, and Men’s Vogue. 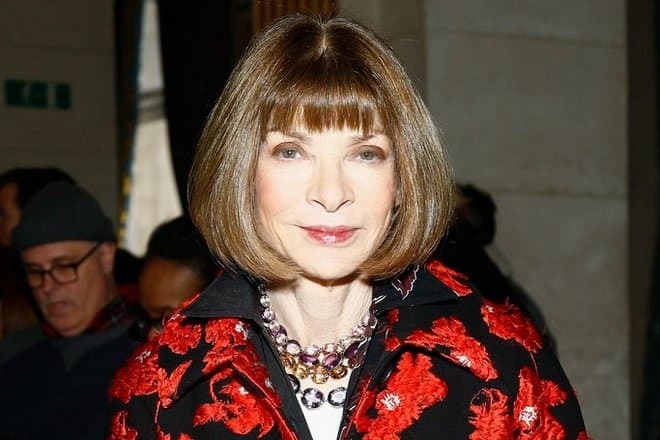 For all this Anna Wintour was recognized "The editor of the year," and the Queen of Great Britain Elizabeth II honored her with the Order of the British Empire in 2008. In 2011 Forbes placed fragile Ms.Wintour (the general in the skirt weighs just 64 kilos and is 170 cm tall) on the 69th position in the list of the most influential women. And in 2013 Anna at the same time received the position of the creative director at Condé Nast publishing house. In May 2017 the head of VOGUE was honored with the title of Dame Commander of the British Empire by Queen Elizabeth II. The permanent editor-in-chief received this award wearing a pink dress from Karl Lagerfeld. What about serious relations in Wintour’s life in the late seventies she had a relationship with the Parisian musical producer Michel Esteban. In 1984 the British woman married the child psychiatrist David Shaffer. She gave birth to his children: Charles (1985) and Katherine (1987). The couple divorced in 1999. Charles got married in 2014, and in 2017 he delighted his parents with the granddaughter Caroline. And Katherine married in July 2018 to the son of the Italian Vogue editor - Francesco Carozzini. Anna's photos, including the pictures with her, are presented in her fan club on Instagram under the title of - annawintourfan. In 2016 Grace Coddington who was the right hand of Anna left the empire of Vogue magazine after thirty years of work. And at the beginning of April of 2018, there appeared the rumors about Anna Wintour’s leaving from the post of the editor-in-chief of this magazine. However, in August of the same year the executive director of Condé Nast Bob Sauerberg told in the interview that madam Wintour would continue working at all the positions of the publishing company. "You either know fashion, or you don't!" "I recommend that you all get fired, it’s a great learning experience." "I rarely carry a bag. You know, I have a head on my shoulders and a Blackberry phone." "Nobody is ugly. Everyone is special. There are just different levels of beauty".